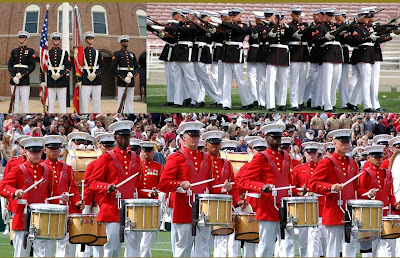 The Battle Color Detachment of the United States Marine Corps are to perform at the Rose Bowl in Pasadena on February 28th 2009. The performance is free and open to the public. I was asked in disbelief by Maddy Horn, a Scouting Mum, when I suggested we take the Scout to see this event, "Is anything still free?" Can you believe that something’s still free? Not Freedom and certainly not Liberty. Of tyrants and patriots again and again. Their work is not free, that's for sure, that's for sure! Only they still are free, say I, say I! Helen Anderson MacDonald passed away June 5, 2008, at the age of 92, after complications of hip surgery. Helen is survived by her husband, Forrest, and daughters Karen M. Rosenthal and Lauren M. Cassatt and their families. That won’t seem trite or empty were it said another way. But then the words you’ve written make my heart begin to sink. Instead of being limited to comments stiff and brief. When you reflect upon the loss of Helen, your fair bride. And shudder when I contemplate that life won’t go as planned. And rob me at a crucial hour of Nancy, my dear wife. I can but only thank God for the blessing of each day. The same is true of Helen who now has flown away.